Students discover the exciting world of natural phenomena through the study of science. The science program is both “minds-on” and “hands-on.” Students study Physical, Life, and Earth Sciences. The Science curriculum builds on key thematic lines across the grades (K-8), including Energy, Evolution, Form and Function, Patterns of Change, Scale and Structure, Stability, and Systems and Interactions. We use the Full Option Science Systems (FOSS) curriculum, which is aligned with the Next Generation Science Standards. Class field trips are often planned to reinforce science concepts. Beginning in second grade, students participate in our annual Science Fair. Younger students create projects in class. 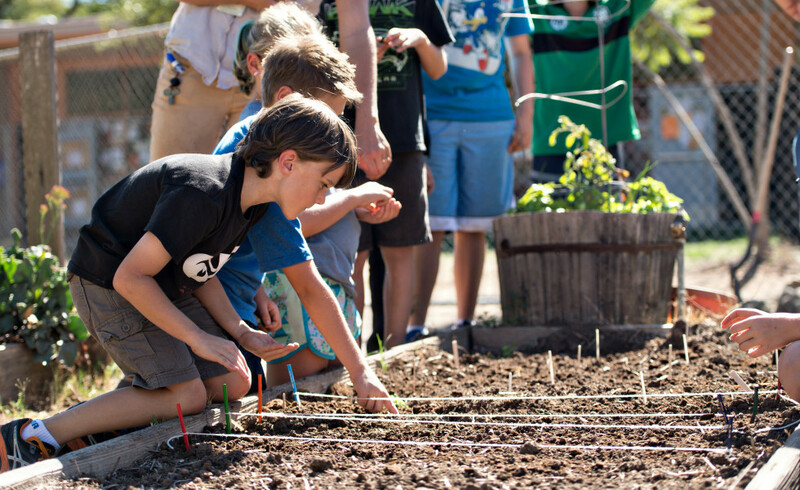 Our school gardens allow students to explore both earth science and life science. Students may spend time in the garden as part of class or during recess. The garden is arranged thematically. In some areas, students have the opportunity to grow food which will be consumed, sold, or donated to the food bank. The garden provides a particularly vivid environmental awareness experience. While much of the science curriculum is initiated by teachers, students have many opportunities to initiate science studies on their own. Students engage in the scientific process. They learn to test ideas, observe results, hypothesize, and analyze data. The Science Fair is one culminating event which encourages students to explore an area which is personally interesting to them. All students in grades K-8 participate in this event. Issues related to the environment and scientific social responsibility are explored throughout the grades. Health and nutrition are a part of our science program.